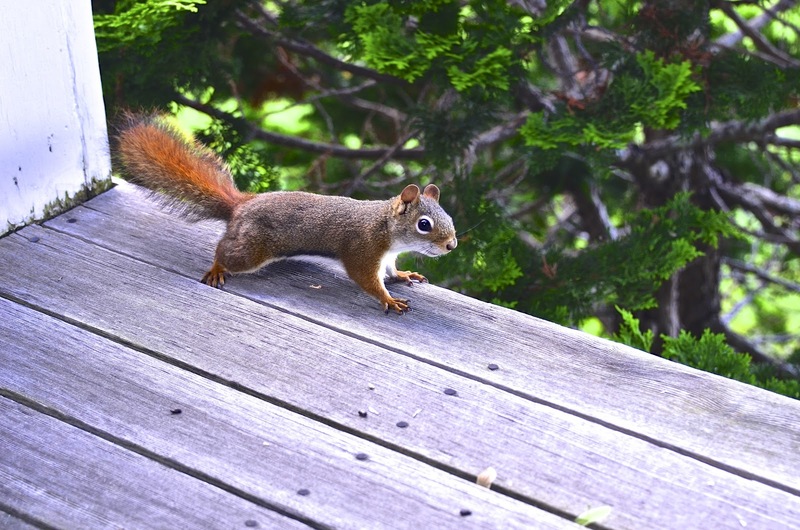 Rita Red Squirrel (who is hanging out on House Lady's deck): So House Lady, I hear you're known for handing out some goodies to us handsome critters. Me: So where did you hear that, Ms. Red Squirrel? Rita Red Squirrel: Oh, we have our sources. Just cause we are up here in Maine doesn't mean word doesn't spread about you softie Philly types. Me: You know, I can't be supporting two households ... there is a limit to generosity! Rita Red Squirrel: Oh, but look at me! 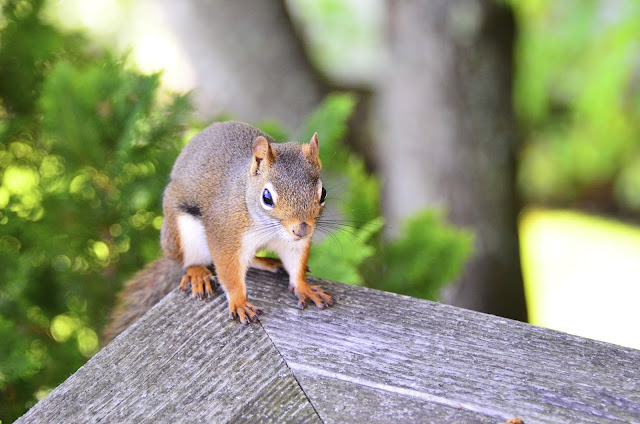 I am sooo much cuter than those common grey squirrels! Besides, I'm smaller and I won't eat near as much. Me: Well, you are kind of cute so I guess a little bit of seed can't hurt. 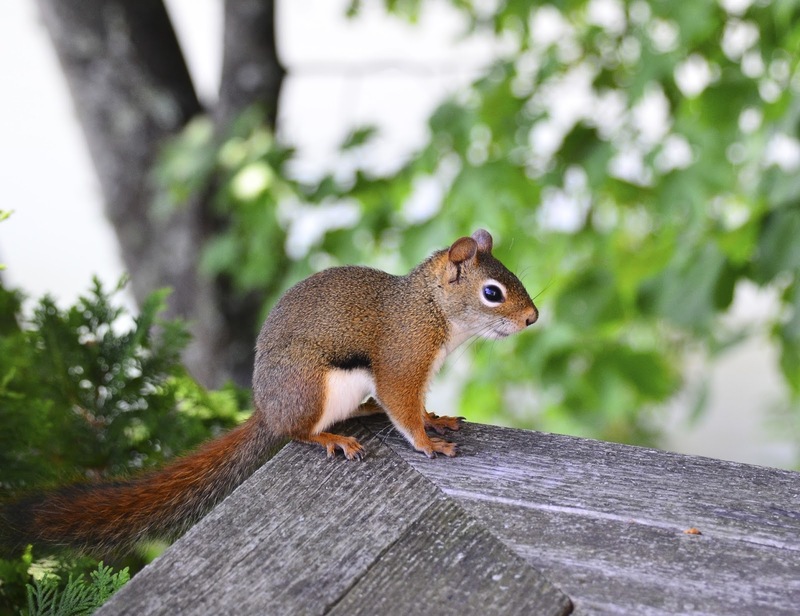 Rita Red Squirrel: Gee umpa pazootie! You serve the really good stuff! Hey cuz, come on over ... you won't believe the smorgasbord this lady serves up! 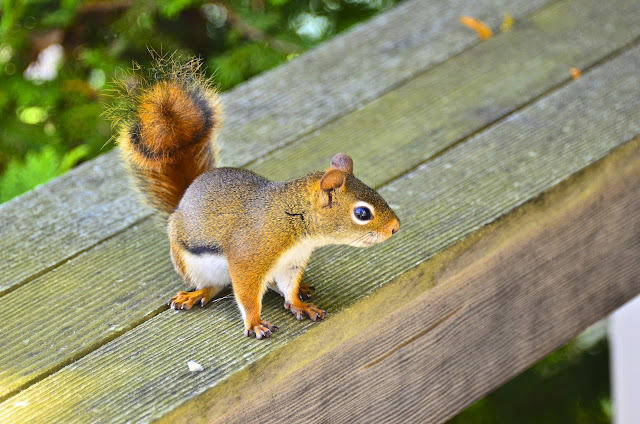 Cuz Carla Red Squirrel (who has suddenly shown up below the railing where Rita Red Squirrel sits): I'm right below you, girl! Drop me some! Me: Oh now wait just a frickin' minute! I thought there was only ONE of you. I can't be supporting your whole kin! 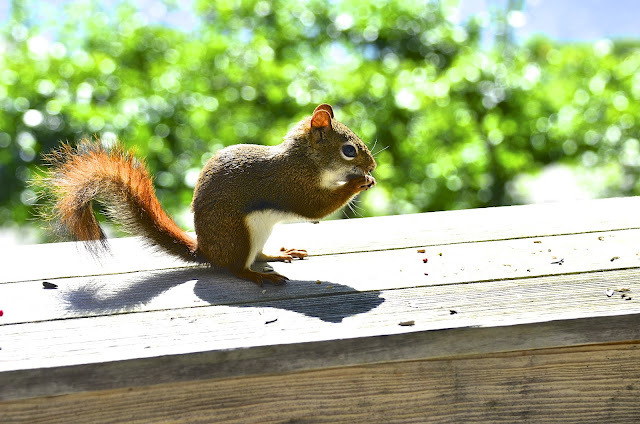 Cuz Carla Red Squirrel: Lady, look at this cuteness! And these toes! How can you resist? Me: Okay, you're right. You are, after all, so dam cute! So what's your preference? 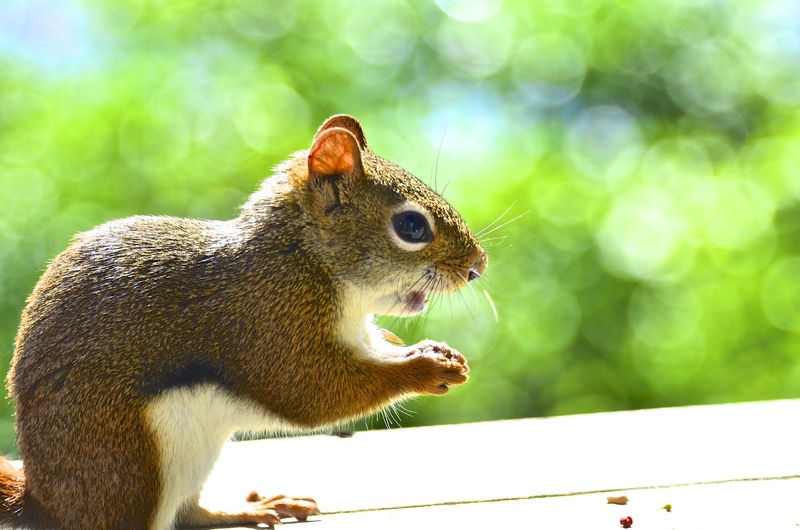 Sunflower seed or peanuts? Reena, what a funny post. Would you like to adopt a few more squirrels. I have way too many here and my little birdies hardly have a chance at the feeders because the squirrels are little piggies. Great post and fun captions. Have a lovely week ahead. What a cutie! They are so small! Oh, you have made my evening, Reena! How adorable! I've never been able to resist them!! What a delightful post and photos for the day! 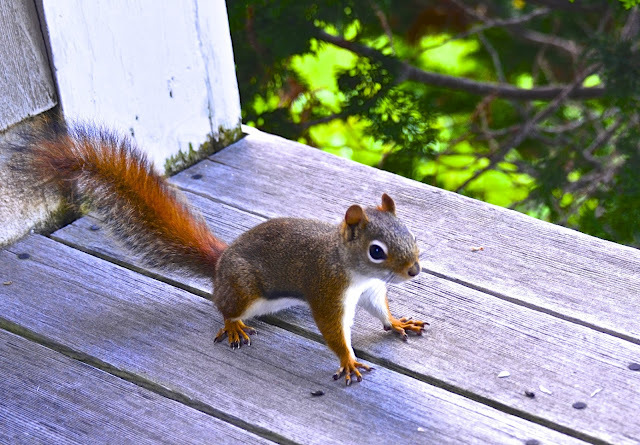 haha send his south...he is a cutey...and i def have a soft spot for squirrels...they def entertain me...smiles. I think word is out. You are a gal with a big heart for squirrels. And a dish full of yummy snacks! LOL! How do you know it is Rita and not Rodney? Oh, never mind. HI Reena..They are some cute that's for sure, and so isn't your little story!! : }!! I haven't heard of and groups..Lol!! On the college campus where I work we have the fattest squirrels around. You can tell when they move through the trees as they bend with the weight! News spread, and the whole family will come. They sure are entertaining and irresistibly cute. Such a great little story and they are so cute. Much prettier than the grey ones. Doesn't take long does it, before all the critters know you are a softie. Gorgeous shots!! I love the dialogue - too funny! You are a sucker for cute critters too. Great photos. I like the toes spread on the deck shot. 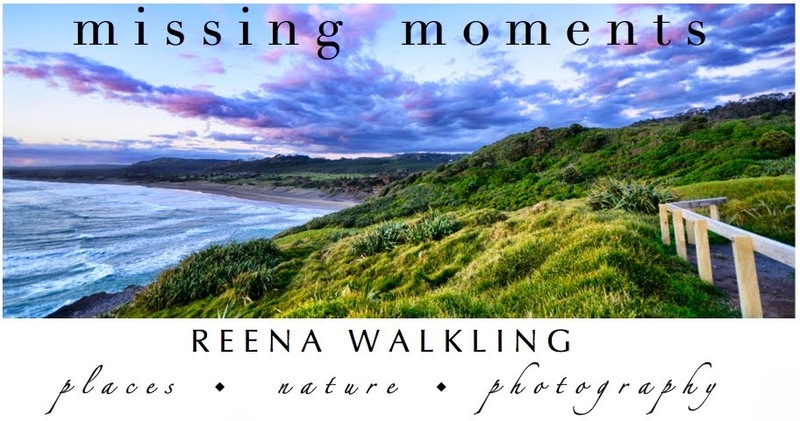 Great post Reena! Love your photo stories! So darn cute! Oh, that's life, pure and simple. And, you make me laugh deeply. Great photos. Such a witty and charming post! Very nice shots, made me remember I forgot peanuts shopping yesterday. Me: Just keep your 'tiny frickin hands' off my winter birdfeeders in Maine! He is just adorable, Reena. You are going to be in BIG trouble when the word gets out - I hope you bought a gigantic bag of peanuts. 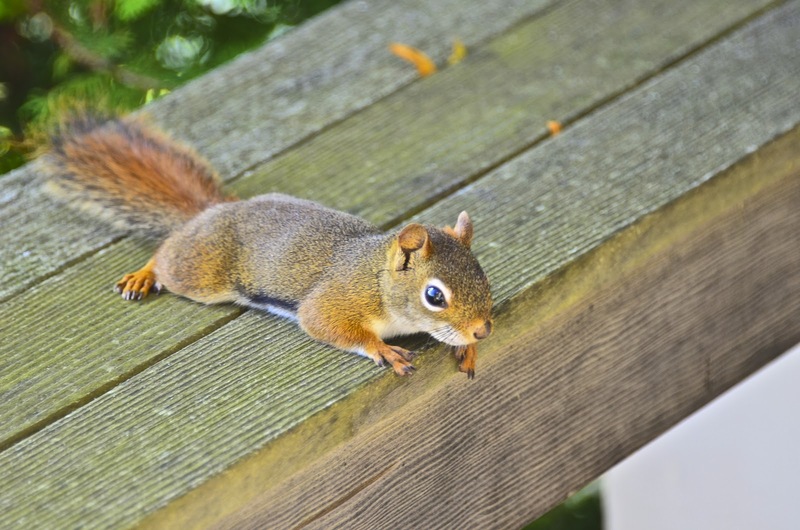 I am going nuts over these squirrels ...are they toooo cute or WHAT!!! Love your captures and that commentary....thanks for the smiles too. Have a great Monday! Haha - let them get in your attic six different times and trust me - they will not look as cute and you will be cured! Little red squirrel is quite cute and it does appear she might not be quite as a glutton as her 3 cousin once removed the Philly/NC squirrel. I am busting a gut. I almost fell out of my chair. That one is right up there. Bravo! Applause! Cheers reena!! How CAN you resist such cuteness? How could you possibly resist such cuteness?? Reena - these are amazing - Can you please make these for sale? I absolutely would love to hang a series of them in my bathroom (I have a crazy love of adorable squirrels) - weird I know but true. If you would consider selling me a few prints I would love to buy some. Oh they are so full of awesome . Cuteness. Too cute. if there is a group then I'll head up the NJ chapter!! Are those guys fully grown? They do look small compared to our neighborhood squirrels. I will only say this...Having had squirrels decide to live in my house I make every attempt not to feed them at all although I refuse to stop feeding the birds although I was advised to. They are very pesty! What a beautiful way to start my day .... Made me smile!! ha! oh my... who could resist that much cuteness? this made me smile all over the place. you keep them up there, though... away from my naughty kitten. They are very cute, I don't think I could resist either. 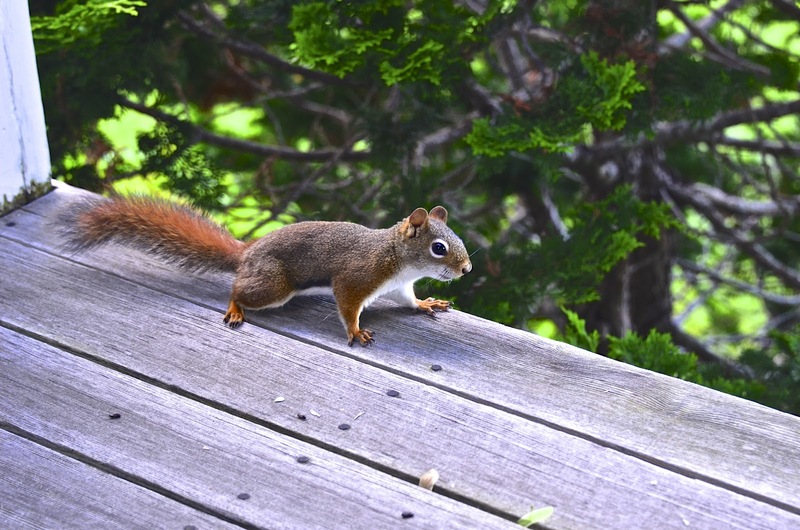 I just love these red squirrel shots! They are absolutely adorable and cute and I can understand why you can't resist their charms. Your dialogue with them is great fun! # 2 and # 4 have my attention! These are such lovely photos. I don't care if they are Rita or Rodney, they are super cute. Keep them coming. Absolutely adorable. I love reds. I had the great pleasure of holding and feeding a young red squirrel orphan. It was the sweetest, gentlest thing. I know they're not all like that but Roxy was. They're a fine little critter.